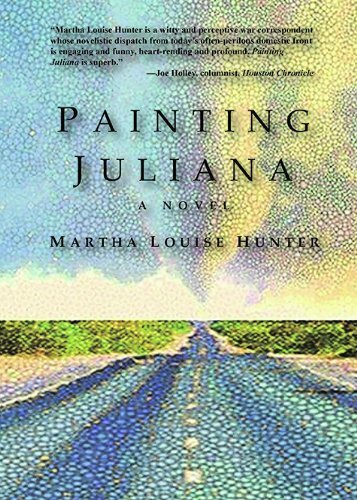 Painting Juliana by Martha Louise Hunter PRAISE from musician Kathy Valentine best known for her work in The Go-Go's and making a name inher new band, The Bluebonnets author Jesse Sublett, Joe Holley of Houston Chronicle, and author Carol Dawson, 5-Star reviews of Painting Juliana by Martha Louise Hunter Including Amazon, Dwell in Possibility,, The Discerning Reader, The Road to Here, and She Treads Softly, plus number three best-selling ranking by Barnes and Noble Arboretum-Austin and The Writers League of Texas. Gary Newsom, Austin Film Society —Painting Juliana is just a phenomenal work. Phenomenal. It reminds me of reading Kurt Vonnegut, JD Salinger, and the later works of John Updike, when I would get to the end and wish that I could forget what I had read and begin again to know the wonderful characters and places in intimate terms -- Hunter does that for me. A new gutsy and brilliant authoress is in our midst, and she can freaking write! Mack Barham, MD Painting Juliana is an absolutely amazing, awesome and wonderful novel. I especially enjoyed pages 313 to 331; "Revelations” from the bible immediately came to mind. While some people are more closely attuned to the overriding forces connecting us to our past, present and future, Ms. Hunter is clearly a savant within that group. Kathy Valentine, Musician and Songwriter best known for The Go-Go's Full disclosure: I'm a Martha Louise Hunter fan. After meeting her socially, I liked her so much, I was reticent to read her damn book. Just because a person is smart, cool and fun doesn't mean they can write a good book, you know? What a silly, worrying twit I can be. The book is fantastic. Respect. Impressed. Enamored girl-crush cemented and intact, next time, next book, I'll be the first of her fans to read it. Shelly Porter, Artist Just finished reading the book, tears streaming down my cheeks. Loved it from all aspects as a daughter, mother, wife and artist. Such a visual and emotional whirlwind of complexities that I'm amazed by Martha Louise Hunter's talent. The ride alongside Juliana was spiritual, cathartic and healing. Jesse Sublett, Musician and Author of Never the Same Again: A Rock n' Roll Gothic —Make sure to leave room on your bookshelf for Painting Juliana -- an impressive debut by an extraordinary writer. Scott Bryan Sowers, Screenwriter and Director of Special Needs —Curl up with this book and feel the heartfelt passion in her words -- every page a picture, I saw it all. I couldn't wait to see where she went next. Dwell in Possibility Fresh, vibrant, and entirely fascinating. Altogether new and thoroughly captivating. She Treads Softly It's hard to believe this is Martha Louise Hunter's debut novel. She had me hooked and anxiously reading right to the end. Cupcake on Books You know that trite phrase about a woman's journey, etc., etc., blah, blah, blah? This here is a WOMAN'S JOURNEY. Don't pass it up. Still Magnolias Reviews I cannot remember when a book has drawn me in with such power. I literally ignored everything I had to do and everyone I knew just to finish this book. I could not put it down. Mom in Love With Fiction Gripping, dynamic, engaging. Painting Juliana is a real work of art. The Discerning Reader Ms. Hunter has a knack for exploring emotional issues without predictability. It’s clear this was an arduous effort, a reflection of her drive pushing through such a monstrous undertaking. Wall-to-Wall Books WOW! It is hard to believe this is the author's first novel! This book had me on the edge of my seat. Talk about a roller-coaster ride. I can’t wait to read more by this new author. The Road to Here What I find amazing is this is her first novel. I couldn’t put it down. Martha Louise Hunter, I can’t wait for your next book. Closed the Cover I loved it! Well done, Martha Louise Hunter, very well done! Garden of Books A fascinating premise and a mesmerizing story that keeps the reader on the edge of their seat to the very last paragraph. Svetlana's Reads & Reviews A ride that I won't forget! First of all I love the cover, love the characters no matter how much some of them made me want to, slap them (I'm looking at you Oliver). Broken Teepee Hunter has a way with a pen. I have to admit I didn't see anything coming. The book is full of twists, turns and revelations that will make your head spin.